Origin Native to North Africa. It is originated in region of Persian gulf- Arabian peninsula, Northern Africa and Northwest India. Date palm is a monocot plant which belongs to Arecaceae family usually cultivated in dry tropical regions for its edible and sweet fruit worldwide. Common names of Dates are Date Palm and Wild Date Palm. It is considered to be originated in region around Persian gulf- Arabian peninsula, Northern Africa and Northwest India. Since ancient times, dates have been cultivated from Babylonia and Mesopotamia to prehistoric Egypt as early as 4000 BCE. Ancient Egyptians used dates to make wine. Dates were vital as a food, making fermented beverage and a source of building material. The medium sized tree forms a clump or grows singly having several stems from single root system. The stout, fibrous and overlapping stems grow from 15 to 25 meters tall. Leaves measures 3 to 5 meters long having spines on petiole and pinnately compound having 150 leaflets. Leaflets are 2 cm wide and 30 cm long. 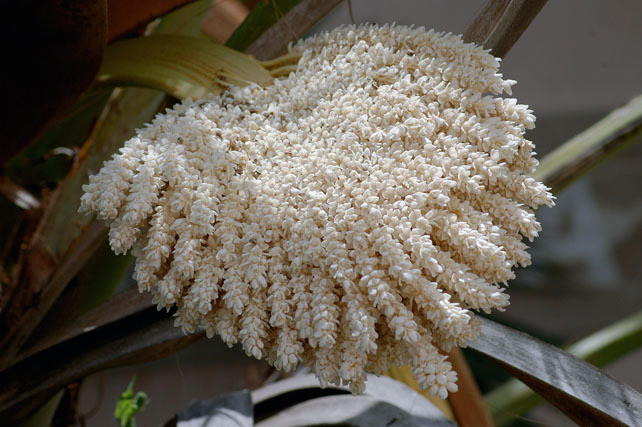 The plant bears male and female flowers separately and is pollinated by wind. In commercial production, the pollination is done with hands and propagated by cuttings in order to diminish number of male trees. Fruits are 3 to 7 cm long, 2 to 3 cm diameter and are oval to cylindrical in shape. Fruit consists of single seed measuring 6 to 8 mm thick and 2 to 2.5 cm long. 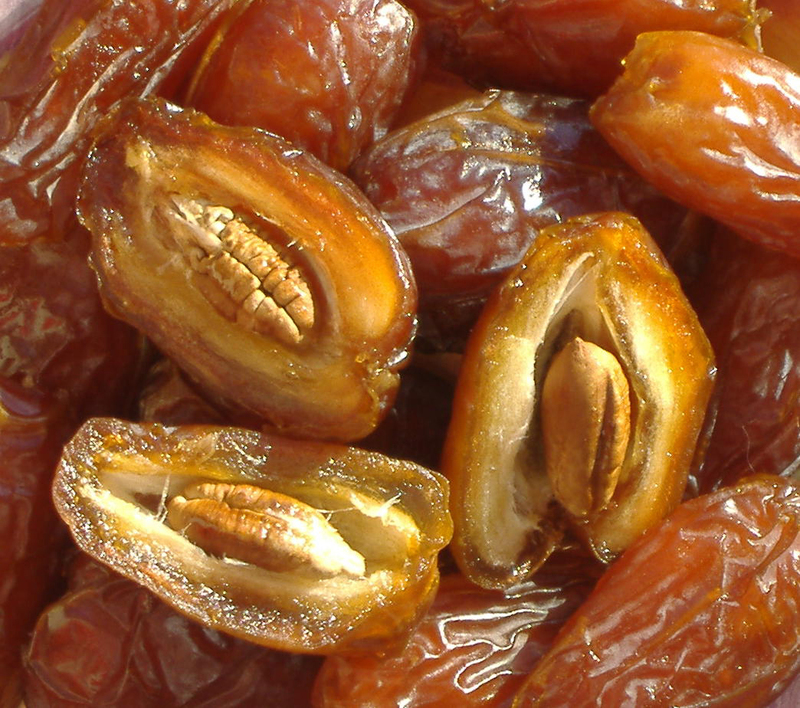 Soft, semi-dry and dry are the three main cultivar groups of date that exists. Dates are a great source of potassium and sugars and are consumed fresh or added to desserts or foods. Besides its flavor, it provides numerous health benefits. 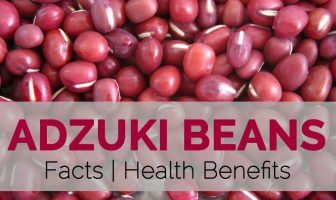 It is a great source of minerals, fiber and vitamins and could provide relief from diarrhea, constipation and other intestinal problems. Dates are used to promote development of muscles, even sexual dysfunction and promote weight gain. In 1980, creation in Saudi Arabia was delivered to almost a half-million tons through 11 million palms due to government subsidies, enhanced technology, along with a regal decree which dates be contained in foods in government as well as civic institutions and that hygienically-packed dates be frequently obtainable in the marketplaces. Growers obtain financial rewards for every offshoot of the high-quality date planted in a recommended spacing. The Ministry of Agriculture has generated training programs through the entire nation to show modern day agricultural techniques, which includes mechanization of all probable procedures in date culture, as well as acknowledgement and also particular roles of the numerous nearby cultivars. In West Africa, close to the Sahara, just dry, sugary types could be developed. Bonavia launched seeds of 26 types of dates through the Near East into northern India and Pakistan in 1869; and, in 1909, D. Milne, the Economic Botanist for the Punjab, launched offshoots as well as established the date like a grown crop in Pakistan. The fruits mature effectively within northwestern India and also at the Fruit Research Center in Saharanpur. In southern India, the weather is undesirable for date creation. Several trees around Bohol within the Philippines have been demonstrated to deal with a good amount of fresh fruits of excellent quality. The date palm has become presented into Australia, as well as into northeastern Argentina as well as Brazil exactly where it might thrive in dry zones. Several dates are usually offering fruits for the market on the little island of Margarita off the coast through northern Venezuela. Seed-propagated dates are located in several tropical as well as sub-tropical regions exactly where they’re appreciated as ornamentals yet the location where the weather conditions are unacceptable for fruit manufacturing. In November 1899, 75 plants were delivered from Algiers to Jamaica. These were saved in a nursery till February 1901 and after that 69 were grown at Hope Gardens. The feminine palms eventually carried huge bunches of fresh fruits however they were ready to fully developed in October throughout the rainy period as well as, appropriately, the fruits rotted as well as fell. 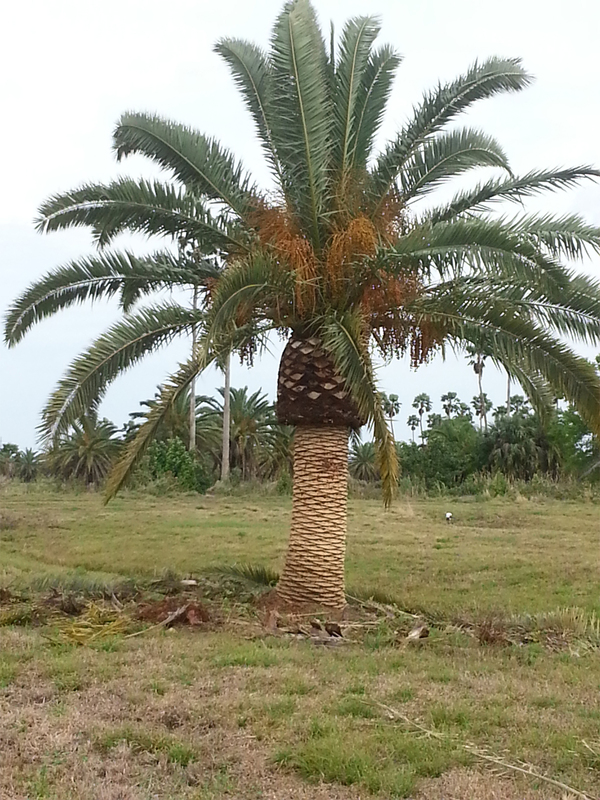 Very rarely have date palms carried normal fruits within the Bahamas as well as South Florida. Spanish visitors introduced the date into Mexico, about Sonora as well as Sinaloa, and Baja California. The palms were just seedlings. Still, the fruits had excellent attractiveness as well as appeared to be released from Baja California in 1837. 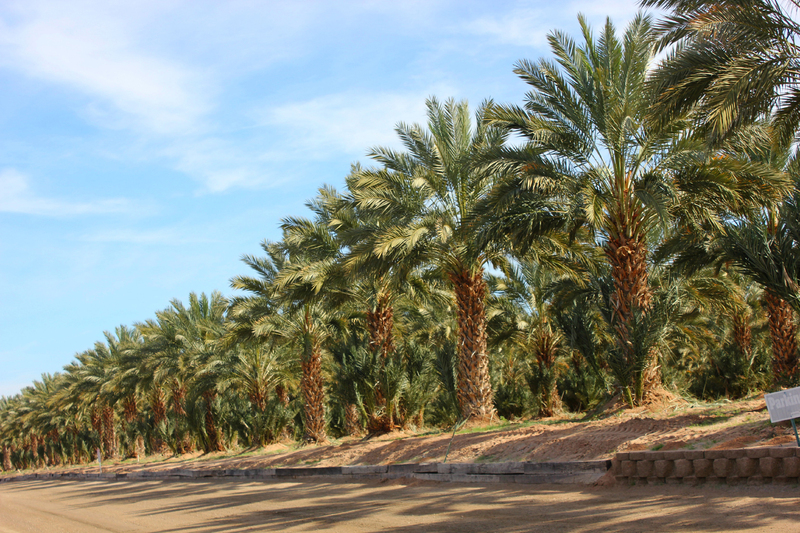 The very first date palms within California were seeds grown by Franciscan as well as Jesuit missionaries within 1769. Potted offshoots from Egypt arrived at California within 1890 and various other introductions have already been converted to that state as well as in the drier regions of southern Arizona about Tempe as well as Phoenix. In 1912, Paul as well as Wilson Popenoe bought a total of 16,000 offshoots of chosen cultivars within Algeria, eastern Arabia and Iraq and also transferred these to California for distribution by their father, F.O. Popenoe who was simply an innovator in motivating date culture in California. It had been a lucrative crop, especially in the Coachella Valley. Nowadays there are about a quarter of the million bearing trees in California as well as Arizona. The tree is dioecious which grows up to 15 to 25 m tall high with a cylindrical, erect and columnar trunk. It has fibrous root and fasciculated root system. It bears large leaves measuring 3 to 5 m long having short and 50 cm rachis base or petiole. Leaflets are lanceolate, entire and measures 15 to 100 cm long and 1 to 6.3 cm wide. Flowers are dioecious so the male and female flowers are formed in spadix (clusters) in leaf axils on separate palms. Male flower has six stamens surrounded by three waxy petals and possess a sweet scent. Each stamen bears two yellow anthers. Female flower measures 3 to 4 mm across. Flowers form into oblong fruits which measures 3 to 7 cm long and 2 to 3 cm diameter. The color of the fruit varies green, bright red, bright yellow, dark to brown, reddish and yellowish to brown. 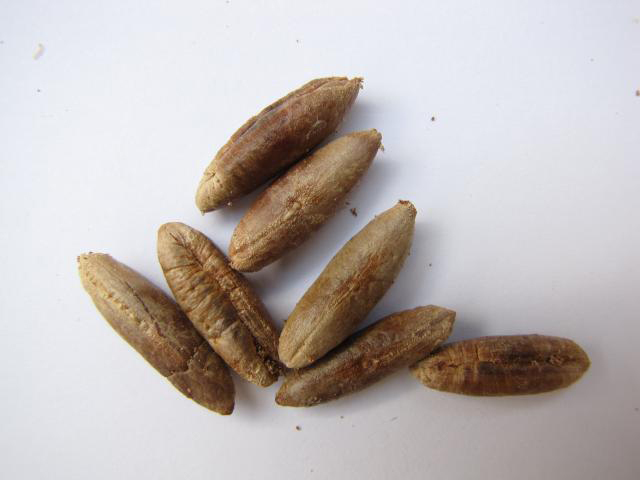 Seeds are oblong, ventrally grooved having a small embryo and hard endosperm. In addition to basic nutritional components, dates are excellent sources of bioactive phytochemicals, belonging to diverse groups of carotenoids, polyphenols, and phytosterols. The composition of these phytochemicals in different date varieties varies widely depending on the stage of maturation, handling and storage conditions, processing methods, moisture content, extent of hydration, etc. Carotenoids are a class of hydrocarbon compounds consisting of 40 carbon atoms (tetraterpenes). Their structure is characterized by an extensive conjugated double-bond system that determines the color. Fruit carotenoids are very diverse, and those present in ripe fruits may be different from those present in unripe fruits. Based on their chemical structure features, carotenoids are classiﬁed as containing oxygen (xanthophylls), such as lutein, violaxanthin, and zeaxanthin, in addition to species-speciﬁc carotenoids, e.g. bixin, capsanthin etc., or as not containing oxygen (alicyclic and acyclic carotenes), such as β-carotene and lycopene, respectively. The total carotenoids content ranges from 0.22 to 3.0 mg per 100 g depending on date variety and maturity stage. Nowadays, polyphenols increasingly attract both scientiﬁc and public attention as a class of bioactive natural products that possess antioxidant, anticancer, and anti inﬂammatory properties. Numerous plant polyphenols have been identiﬁed, sharing distinct structural features. Polyphenols have assorted structures that contain at least one aromatic ring with one or more hydroxyl groups in addition to other substituents. The main classes of polyphenols are ﬂavonoids, phenolic acids, stilbenes, tannins, and lignan. The term “phytosterols” covers plant sterols and their hydrogenation counterparts, phytostanols, which are found exclusively in plants. They are structurally related to cholesterol but differ from cholesterol in the structure of the side chain. They consist of a steroid skeleton with a hydroxyl group attached to the C-3 atom of the A-ring and an aliphatic side chain attached to the C-17 atom of the D-ring. Sterols have a double bond, typically between C-5 and C-6 of the sterol moiety, whereas this bond is saturated in phytostanols. Triterpenoids are the precursors of steroids with a functionalized C30 skeleton. Pentacyclic triterpenes are one group of secondary plant metabolites showing promise in treating cancer by different modes of action. At least six vitamins (thiamin, riboﬂavin, niacin, ascorbic acid, pyridoxine, and vitamin A) have been reported to be present in dates in visible concentrations. Dates contain B- complex vitamins, such as thiamine (B1), riboﬂavin (B2), niacin (B3), pantothenic acid (B5), pyridoxine (B6), and folate (B9), and vitamin K. Some vitamins (B3, B5, B6, and B9) are found in higher concentrations in dates. The niacin content varies between 1.27 and 1.61 mg/100 g. Quantitative analysis of water soluble vitamins (B1, B2, B3, B5, B6, B9, and B12) showed a signiﬁcant variation within the different cultivars and the developing stages of dates. Vitamins B1, B3, B5, and B6 are highest in mature stages, and vitamins B2, B9, and B12 have been detected in immature fruit. Vitamin C content is found to be very low in dates. The content of vitamin C ranged from 8.5 μg/100 g to 10.5 μg/100 g, respectively, in ‘Bekraray’ dates and ‘Deglet Nour’. As compared to other dried fruits, dates can therefore be considered a reasonable source of vitamins. Generally, fresh dates contain higher concentrations of vitamins as compared to dry dates, as the vitamins are lost in the drying process. Date fruit extract can inhibit peroxidation and protein oxidation as well as neutralize superoxide and hydroxyl radicals. Many medicinal properties, such as hepatoprotective effect, nephrotoxic protection, and neuroprotective effect, are related to the antioxidant activities of date fruit. The antioxidant and free radical scavenging activities of dates are attributed to the content of polyphenols, carotenoids, and mineral selenium. Selenium activates many enzymes related to reactive oxygen species (ROS) detoxiﬁcation. It is reported that dates had the second-highest antioxidant value out of 28 fruits commonly consumed in China. A total of 80 volatile compounds have been detected in date fruit, including 20 esters, 19 alcohols, 10 terpenes, 13 aldehydes, 6 ketones, 12 hydrocarbons, and 1 lactone, and the identiﬁed compounds accounted for 90.7–99.6% of the total aroma proﬁle. The number of aromatic compounds differs according to the variety and the maturation stage. Other compounds (2-propanol, isoamyl alcohol, phenylethyl alcohol, isoamyl acetate, etc.) have also been identiﬁed in Tunisian dates. Each volatile compound was characterized by an odor threshold. Alcohols, aldehydes, ketones, and terpenes were responsible for the citrus, ﬂoral, and fruity characteristics of date aroma; two straight chain aldehydes, nonanal and decanal, were suggested to be responsible for the fresh and slightly green notes of dates; and terpene or aliphatic alcohols are characterized by herbaceous, fruity, citrus, ﬂoral, and fungal odors. Dates provide relief from intestinal disorders, constipation, anemia, heart problems, diarrhea, sexual dysfunctions and abdominal cancer. It supports healthy weight gain. It has high content of minerals, vitamins and fiber. It contains calcium, oil, potassium, iron, sulfur, manganese, phosphorus, magnesium and copper which is helpful to maintain overall health. 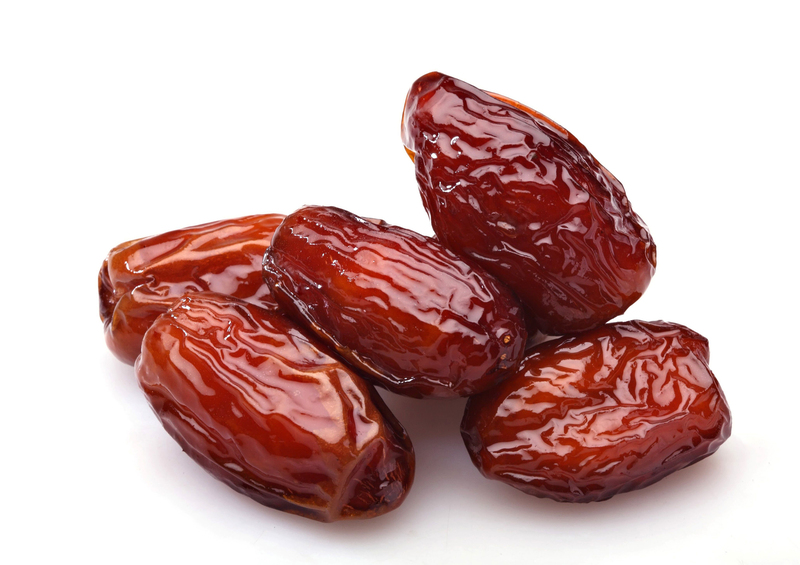 Vitamins such as riboflavin, thiamin, folate, niacin, Vitamin K and Vitamin A are also found in Dates. Dates have laxative properties so is consumed frequently by the people with constipation. To get laxative effect, soak dates in water overnight and consume it in morning when it turns into syrup. Dates have high content of soluble fiber that assist to promote healthy bowel movements and passage of food through intestinal tract that provides relief from constipation. Study shows that pulp extract of dates helps to promote gastrointestinal transit activity and helps to treat constipation. Fruit pulp corrects deregulation of mineral content that occurs at the time of constipation. Fiber found in dates assist in prevention of cancers of digestive system. Being a great source of fiber, it could solve this health problem. The consumption of 20 to 35 grams of fiber regularly makes stool soft and prevents this problem. Dates have meaningful amounts of minerals which make it a superfood to strengthen bones and counteract painful and debilitating problems such as osteoporosis. It possesses manganese, selenium, magnesium and copper that is vital for bone development and strength. Consume dates to boost bones. Rich in Vitamin K, Dates acts as blood coagulant and assists to metabolize bones. Study reported that dates possess boron which is healthy for bone health. Dates have nicotine which is helpful to cure various intestinal problems. The continuous intake helps to prevent growth of pathological organisms and stimulates the growth of healthy bacteria in intestines. It contains both soluble and insoluble fibers as well as amino acids that promotes digestion of food and makes it more efficient so that the nutrients would be absorbed by digestive tract. Diarrhea could be worsened or cured with the choice of foods we consume. Dates have high content of potassium that assist to improve the condition of diarrhea. Anemia is the low quantity of red blood cells found in human body and caused due to deficiency of iron. High content of minerals in dates is helpful for various health conditions. Its impressive iron levels make it a great choice for the people having anemia. Dates have high content of iron that balance iron in anemic patients, increase strength, energy and decrease feelings of sluggishness and fatigue. Consume it regularly to promote amount of iron in blood. High content of iron helps to balance deficiency of iron in anaemic patients but also promote vitality and strength. Dates have organic sulfur in it which helps to lower seasonal allergies and allergic reactions. The study shows the positive impact of organic sulfur compounds on people suffering from Seasonal Allergic Rhinitis that affects 23 million of people in United States. Add sulfur to the diet to lower the effects of seasonal allergies. Dates contain proteins, sugar and various essential vitamins. Consume dates with cucumber paste that helps to maintain normal and balanced weight rather than over slimming. One kg of dates possesses 3000 calories which helps to obtain daily requirements for the body. The study performed on lambs shows that ground date seeds when fed resulted to gain in weight. It could also be observed in humans but more research is needed. Dates have high content of natural sugars such as fructose, glucose and sucrose. It makes a great snack for boosting energy. People consume dates as a quick afternoon snack when they feel sluggish and legthargic. Chew some dates when you feel exhausted to regain an immediate energy. Nervous system includes both peripheral nervous system and central nervous system. Dates contain vitamins that help to promote health and functions of nervous system. It promotes alertness and speed activity of brain. It is a great source of food for the aged people because their nervous system becomes unsupported and sluggish and dates helps to keep their mind sharp. It controls the heart rate and level of blood pressure in the body by preventing the chances of heart stroke and coronary heart disease. Soak the dates in water overnight and consume after crushing it in the morning. It shows positive effect on those people having weak hearts. Dates are a great source of potassium that helps to lower the chances of stroke and other heart related problems. Moreover, being a delicious snack it lowers LDL cholesterol levels in the body which has become major contributing factor of heart problems such as stroke, heart disease and heart attacks. Consume it twice a week to improve overall heart health. Antioxidants found in dates assist in prevention of atherosclerosis, the condition when the arteries become hard and clogged with plaque. Antioxidants assist in stimulation of removing cholesterol from artery cells. Isoflavones in it lowers the chances of cardiovascular problems. The daily consumption of dates is associated with lowering the chances of coronary heart problems. Dates are considered to increase sexual stamina. Soak dates in a goat’s milk (fresh) overnight, grind it in the milk by adding cardamom powder and honey. It acts as a tonic to increase sexual endurance and lower sterility that is caused by sexual problems. The study shows that dates and its oil have high flavonoid components and estradiol that helps to increase sperm motility and count and also promotes increased testes size as well as weight. For a masculine boost consume dates as it is a great natural aphrodisiac. This fruit has high content of magnesium which is well known for lowering inflammation. The study shows that an increase intake of magnesium lowered the inflammatory indicators such as tumor necrosis factor alpha, C-reactive protein and interleukin 6. It lower lowered inflammation in arterial walls. The findings of the study shows the reduction in chances of cardiovascular problems, Alzheimer’s disease, arthritis and other inflammation associated health problems. The study shows that Date encountered labor parameters as well as delivery outcomes. Researchers shows the intake of Date for four weeks before labor lowered the requirement for induction and augmentation of labor and provided more favorable, non-significant, delivery outcomes. Results certified a randomized controlled trial. Store dates at room temperature within an air-tight pot for a number of months or even refrigerate for as much as 1 year. A small serving size of dates provides high content of calories. The regular consumption of dates could add calories to the diet. The daily intake results in buildup of calories that could lead to weight gain. Dates have high content of fiber. ¼ cup provides 2.7 grams of fiber. The recommended intake of fiber is 20 to 35 grams per day. But excessive consumption of dietary fiber causes digestive problems such as constipation, excess gas and bloating. ¼ cup serves 27 grams of sugar. Dates are sweet naturally which comes from the content of fructose. Fructose is the natural sugar which is found in few vegetables and fruits. Some people might face problem in digesting sugar. In poor fructose absorption and fructose intolerance, the sugar is passed through digestive system whole as the body does not have ability to break it down. When reached to intestines, it causes gas, diarrhea and abdominal pain because it reacts with natural bacteria in gut. Dates are considered to be high glycemic food due to high content of sugar and carbohydrates. It have high glycemic load so its excessive consumption increases the risk of heart diseases, type 2 diabetes and obesity. The teeth may rot when you eat dates simply because every cup offers a lot more than 100 g carbohydrate. Whenever bacteria within your mouth ferment, your teeth can easily rot due to the acid. Any kind of food along with carbohydrates can result in tooth decay in case the food stays in your teeth for too much time. To decrease your danger for cavities, wash the mouth along with water as well as brush the teeth following a meal, and don’t drink sugary drinks in between meals. It might be not practical to manage in depth together with date cultivars here. Paul Popenoe outlined 1,500 as well as supplied explanations of the fruit as well as palm, along with the background and importance, of the most basic, country simply by nation, in 90 pages of his book, The Date Palm, developed in 1924 yet released in 1973 as well as easily available. In Iraq, there are actually at present 450 female cultivars, the most crucial of which are usually: ‘Zahdi’ (43% of the crop; lower in price); ‘Sayer’ 23% of the crop as well as high-priced); ‘Halawi’ (13% of the crop as well as high-priced); ‘Khadrawi (6% of the crop as well as high-priced); additionally ‘Khastawi, ‘Brem’, as well as ‘Chipchap’. Sawaya and colleagues (1983) have documented on the sugars, tannins as well as vitamins in 55 main date cultivars of Saudi Arabia. ‘Barhi’- released into California within 1913 from Basra, Iraq; almost round, mild amber to darkish brown whenever ripe; gentle, together with thicker flesh as well as abundant taste; of outstanding quality. For shipment requires refrigeration once selected, after that curing as well as special packing. ‘Dayri’ (the “Monastery Date”)-introduced into California from convent grounds in Dayri, Iraq, in 1913; lengthy, slim, almost black, gentle. Palm needs additional care. Not developed thoroughly within California. ‘Deglet Noor’-a top date within Algeria as well as Tunisia; as well as in the second country it really is developed in inland oases and is also the main export cultivar. It absolutely was launched into California within 1900 and today comprises 75% of the California crop. It really is semi-dry, not so sweet; retains effectively; is moisturized just before delivery. Significantly utilized for cooking. The palm is higher producing although not very resistant of rain as well as environmental moisture. ‘Halawy’ (‘Halawi’)-introduced into California through Iraq; gentle, incredibly sweet, small to moderate; might wilt throughout maturing until the palm is well-watered. It really is particularly resistant of moisture. ‘Hayany’ (‘Hayani’)-the cultivar most substantially grown in Egypt; however, not exported. Introduced into California in 1901, and is also distributed fresh new; isn’t easy to cure. The fruit is dark-red to almost black; gentle. The palm is probably the most cold-tolerant. ‘Khadrawy’ (‘Khadrawi’)-important within Iraq as well as Saudi Arabia, and is also developed to some degree within California as well as Arizona. It’s the cultivar most in-demand simply by Arabs yet too dark in color to become well-known around the American marketplace, even though it is really a gentle date of the highest quality. It really is early-ripening; doesn’t keep too well. This particular cultivar is definitely the tiniest delicious date palm developed in the usa and it’s also pretty resistant of rain as well as moisture. ‘Khastawi’ (‘Khustawi’; ‘Kustawy’)-the top soft date in Iraq; sirupy, tiny in dimensions; valued for treat; maintains well. The palm is big as well as energetic and also generates its offshoots high in trunk area in California. The fruit is resistant against moisture. ‘Maktoom’-introduced into California from Iraq in 1902; huge, red-brown; thick-skinned, gentle, mealy, moderate sweet; resistant against moisture. ‘Medjool’-formerly released from Morocco; 11 off-shoots imported into California from Bou Denib oases in French Morocco in 1927; is currently promoted like a luxurious date within California; is big, gentle, as well as delicious yet ships properly. ‘Saidy’ (‘Saidi’)-highly prized in Libya; gentle, extremely sweet; palm is actually a hefty bearer; requires a hot weather conditions. ‘Sayer’ (‘Sayir’)-the most generally developed cultivar within the Old World and a lot released to Europe as well as the Orient; dark orange-brown, of moderate size, gentle, sirupy, and infrequently a few of the sirup is exhausted out as well as sold individually; not of top quality however the palm is probably the most resistant of salt along with other undesirable elements. ‘Thoory'(‘Thuri’)-popular within Algeria; really does very well within California. Fruit is usually dry; whenever treated is brown-red together with bluish bloom with extremely old and wrinkly skin as well as the flesh is oftentimes tough as well as breakable however the taste is nice, fairly sweet as well as nutty. Keeps well; usually carried on trips. The palm is strong together with short, stiff leaves; contains seriously, as well as groups are extremely big; fairly resistant of dampness. ‘Zahdi'(‘Zahidi’)-the oldest-known cultivar, eaten in great quantity in the centre East; launched into California about 1900. 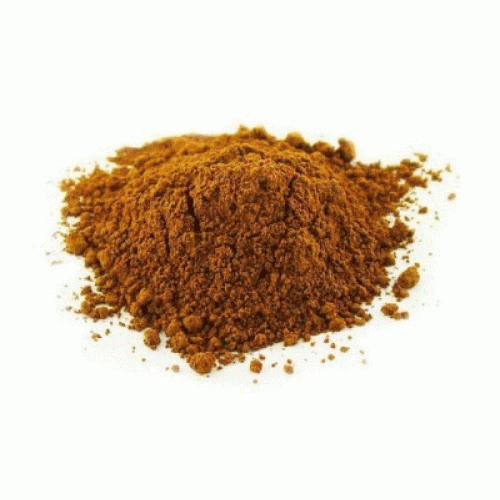 Of moderate dimension, round, mild golden-brown; semi-dry but gathered and traded in 3 phases: gentle, medium-hard, and hard: extremely sugary; keeps well for a few months; much utilized for cooking functions. 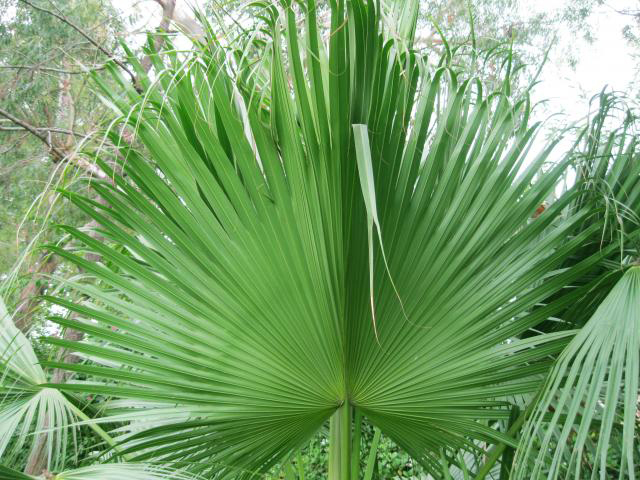 The palm is strong, rapid developing, heavy bearing; drought tolerant; has very little tolerance of mugginess. ‘Amir Hajj’-introduced from Mandali Oasis within Iraq in 1929. The fruit is gentle, together with thin skin as well as thicker flesh; of good quality yet very little cultivated within the United States of America. ‘Iteema’-offshoots from Algeria were launched into California in 1900. The fruit is big, oblong, mild amber, gentle, extremely sweet. Much developed in Algeria although not rain resistant as well as little developed in California. ‘Migraf’ (‘Mejraf)-a extremely popular cultivar within Southern Yemen. Fruit is mild golden-amber, big; of excellent quality. In inland oases of Tunisia, along with the ‘Deglet Noor’, there is certainly ‘Ftimi’ (‘Alligue’) which can be likewise susceptible to moisture, significantly less fruitful and much less disease-resistant. ‘Manakbir’ features a big fruit as well as ripens sooner yet has got the drawback that the palm delivers very few offshoots and its particular multiplication is restricted. Dates are used to treat colds, sore throats and coughs. In Ayurvedic medicine, it is used for treating bronchitis, inflamed wounds, headaches, clouding of cornea, gastric complaints and kidney diseases. In Arab medicine, dates are used to provide relief from coughs, regulate urination, clean out system and promote fertility. Use the poultice made from green date kernels for treating genital ulcers. In Indian traditional system of medicine, Ayurveda, it is used as a general tonic. 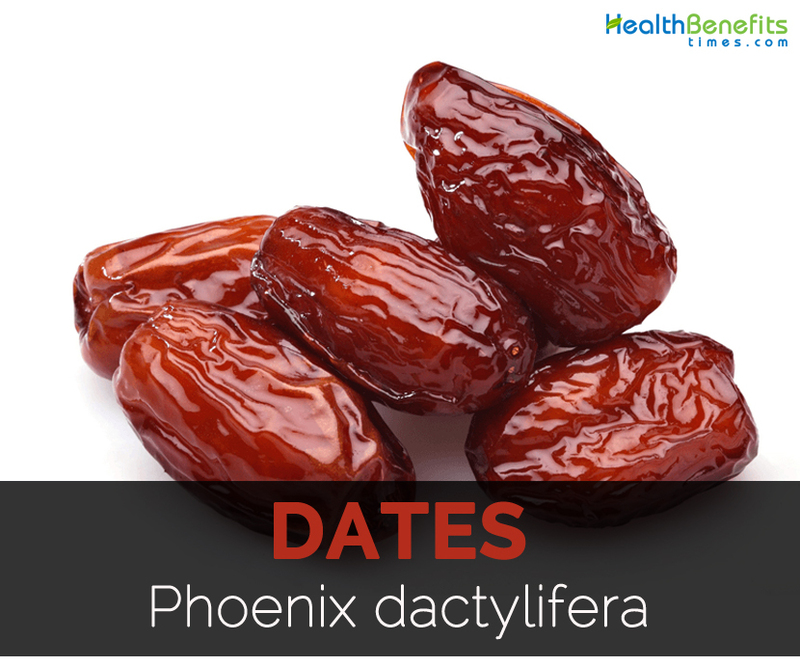 In traditional medicine, dates are used for treating hypertension and diabetes. In folk medicine, dates with other herbs are used for treating coughing, bronchitis, burning sensation, fainting and other infections. It is used to make date wine. Dates are consumed fresh or used in preparation of desserts and foods. Seeds are grounded into flour and used to make bread at the times of scarcity. The edible flowers are used in salads. Soft dates are consumed out of hand. It could be stuffed with fillings such as walnuts, almonds, candied orange, pecans, tahini, lemon peel, cream cheese or marzipan. Chop the dates and use it in sweet and savory dishes, dessert items and puddings. In Middle East, vinegar from dates is made. In Southeast Spain, dates are wrapped in bacon and shallow fried. 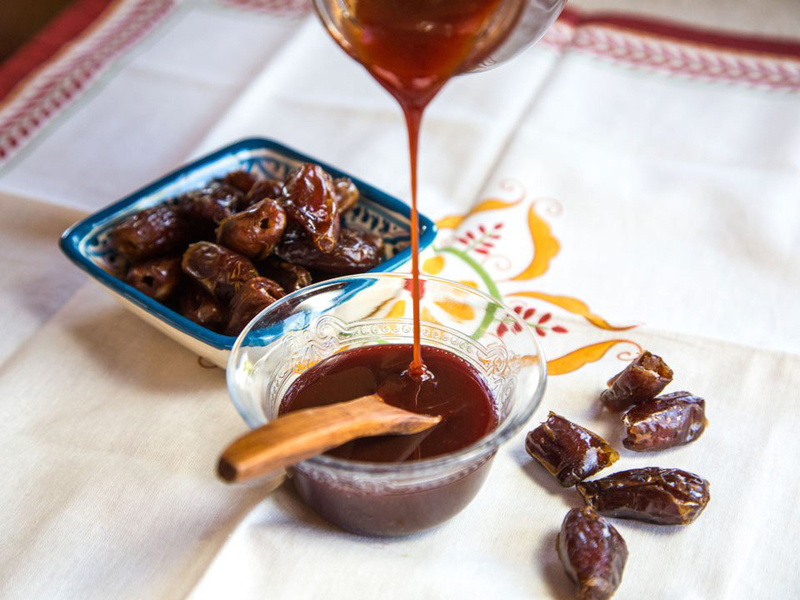 Date syrup is used for cooking chicken, making desserts and sweets in Israel. Sap is used to make jaggery and palm syrup. Process the dates in the form of jelly, jam, syrup, powder, spread and paste. Young leaves are cooked and consumed as vegetable. In Libya, roasted seeds are popular. Roasted seeds are used for preparing a canua in Libya and Saudi Arabia. Add flower buds to salad or ground with dried fish for making condiment for bread. In folkloric medicine, dates are used for treating fever and respiratory diseases. The decoction, infusion, paste, syrup made from dates are useful for colds, sore throat, bronchial catarrh and provide relief from fever as well as various problems. In India, gum is used for treating gastro-urinary problem and diarrhea. It is believed to counteract alcohol intoxication. Roots are used to treat toothache. Add dates to breakfast cereal. Blend dates with frozen fruits and yogurt to make smoothie. Dates could be used instead of raisins for oatmeal date cookies. Make chutney by sautéing dates with ginger, garlic and other spices. Top frozen yogurt or ice cream with chopped dates. In Sahara, dried dates are fed to horses, camels and dogs. Stripped clusters of fruit are used as brooms. Dried and grounded ones are used to feed chicken. In North Africa, leaves are used to thatch huts and coverings. Matured leaves are made into screens, mats, fans, baskets, crates, hats and furniture. Leaf bases are used as fuel. Native Native to North Africa. It is originated in region of Persian gulf- Arabian peninsula, Northern Africa and Northwest India. Calories in 1 date, pitted (24 g) 66 Kcal. Phoenix atlantica var. Maroccana A. Chev. Phoenix dactylifera var. Adunca D.H. Christ ex Becc. Phoenix excelsior Cav. Nom. Illeg. Calories 66 Kcal. Calories from Fat 0.36 Kcal. Calories 415 Kcal. Calories from Fat 5.13 Kcal.